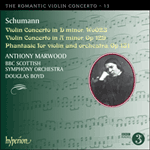 As with the Phantasie, Schumann sent the score of the Violin Concerto in D minor, WoO23 (composed between 27 September and 3 October 1853) to Joachim for advice, but this time the violinist was less enthusiastic. While he praised the melody of the slow movement, for the most part he found the solo part unidiomatic (Schumann’s extensive use of arpeggiated figures perhaps reflected his recent immersion in the Sonatas and Partitas of J S Bach, for which he had devised piano accompaniments). Joachim later admitted that he thought the music showed signs of exhaustion. It was to be Schumann’s last orchestral work. The Violin Concerto is a grandiose, minor-key counterpart to Beethoven’s example. It opens with a brooding theme played by full orchestra; the lyrical second subject then makes a brief appearance before the violin enters. The form of this movement and the relationship between soloist and orchestra is much more conventional than that of the Cello Concerto but, again, the second and third movements are connected. Here, though, it is music from the slow movement that reappears in the finale: the syncopated orchestral theme. It is somewhat surprising that Schumann did not choose to recall the soloist’s melody instead, for it had a habit of turning up in other places: it resembles the opening vocal line of Frühlings Ankunft, Op 79 No 19, the middle section of ‘Vogel as Prophet’ from Waldszenen, and the Allegro of Norbert Burgmüller’s Second Symphony, which Schumann had recently orchestrated. The melody is also strikingly similar to the one he claimed was dictated to him by the spirits of Schubert and Mendelssohn during hallucinations he experienced in February 1854, on which he wrote piano variations (commonly referred to, with some poetic licence, as the Geistervariationen). Joachim found the finale of the Violin Concerto overly repetitious, a criticism often levelled at Schumann’s late music. Occasionally, the impression of repetitiveness resulted from the composer focusing on a limited number of thematic motifs. On other occasions, it indicates an ill-chosen tempo. In the case of the Violin Concerto, until a new edition appeared in the 1980s, performers tended to take the second movement more slowly than the autograph suggested, while pushing the finale’s polonaise forward. Despite rehearsing the work with Hannover’s Court Orchestra, Joachim never performed the Concerto in public and recommended that it should not be published until one hundred years after Schumann’s death (a view with which his fellow-executors of the composer’s musical estate, Clara and Brahms, concurred). However, in 1933 Joachim’s great-nieces, the violinists Jelly d’Arányi and Adila Fachiri, claimed to have received instructions from beyond the grave that they should seek out Schumann’s concerto. (On a more prosaic level, they may have been aware that the first movement had been played at the tenth anniversary of the Schumann Gesellschaft in Zwickau three years earlier.) The score was located in the Prussian State Library and, against the wishes of Schumann’s daughter Eugenie, was prepared for publication by Schott, with the assistance of composer Paul Hindemith. The Violin Concerto was premiered before Nazi luminaries Robert Ley and Joseph Goebbels on 26 November 1937, played by Georg Kulenkampff and the Berlin Philharmonic, conducted by Karl Böhm. What for decades had been considered a failure was now, for political reasons, heralded as a masterpiece—even as a replacement for Mendelssohn’s popular Violin Concerto (which was barred from performance because of the composer’s Jewish roots). Ten days later Yehudi Menuhin—who as a Russian-American Jew had not been allowed to give the premiere in Germany—performed the concerto with piano accompaniment at New York’s Carnegie Hall; he subsequently played the full version with the St Louis Symphony Orchestra. Menuhin recognized Schumann’s Violin Concerto as the ‘missing link’ between Beethoven and Brahms. He claimed it has the ‘same human warmth, caressing softness, bold manly rhythms, the same lovely arabesque treatment of the violin, the same rich and noble themes and harmonies’. Schumann’s debt to Beethoven can be detected in the way he embeds the solo violin within the orchestra; they work as partners, sharing material. Brahms is forecast in the way Schumann makes motivic connections between movements. We can thus hear these works for violin and orchestra less as marking the end of Schumann’s career, than as a bridge between generations. Comme il l’avait fait pour la Phantasie, Schumann envoya la partition du Concerto pour violon en ré mineur, WoO23 (composé entre le 27 septembre et le 3 octobre 1853) à Joachim, en lui demandant son avis, mais cette fois le violoniste se montra moins enthousiaste. S’il loua la mélodie du mouvement lent, il trouva la partie solo tout sauf idiomatique (l’usage extensif de figurations arpégées traduit peut-être la récente immersion de Schumann dans les Sonates et Partitas de J. S. Bach, pour lesquelles il avait conçu des accompagnements pianistiques). Plus tard, il reconnut avoir pensé que cette musique présentait des signes d’épuisement. Ce devait être la dernière œuvre orchestrale de Schumann. Le Concerto pour violon est un équivalent grandiose, en mineur, de celui de Beethoven. Il s’ouvre sur un thème menaçant, au grand orchestre; le second sujet lyrique fait un brève apparition avant l’entrée du violon. La forme de ce mouvement et les relations soliste-orchestre sont bien plus conventionnelles que dans le Concerto pour violoncelle même si, là encore, les deuxième et troisième mouvements sont liés. Ici, toutefois, c’est la musique du mouvement lent qui réapparaît dans le finale: le thème orchestral syncopé. Il est un peu surprenant que Schumann n’ait pas préféré rappeler la mélodie du soliste, car on la retrouve ailleurs: elle ressemble à la ligne vocale qui inaugure Frühlings Ankunft, op. 79 nº 19, à la section centrale de «L’Oiseau-Prophète» des Waldszenen et à l’Allegro de la Symphonie nº 2 de Norbert Burgmüller, qu’il venait d’orchestrer. Elle ressemble aussi étrangement à la mélodie qu’il affirma lui avoir été dictée par les esprits de Schubert et de Mendelssohn lors d’hallucinations survenues en février 1854 et dont il tira des variations pour piano (communément appelées, non sans quelque licence poétique, Geistervariationen). Joachim trouva le finale du Concerto pour violon trop répétitif, ce qu’on reproche souvent à la musique tardive de Schumann. Parfois, cette impression de répétitivité vient de ce que le compositeur s’était concentré sur un nombre limité de motifs thématiques. D’autres fois, elle est le signe d’un tempo mal choisi. Dans le cas du Concerto pour violon, et avant la parution d’une nouvelle édition dans les années 1980, les interprètes tendaient à prendre le deuxième mouvement plus lentement que ne le suggérait le manuscrit autographe, tout en poussant en avant la polonaise du finale. Joachim répéta le Concerto avec l’Orchestre de la cour de Hanovre mais il ne le joua jamais en public et recommanda même de ne le publier qu’un siècle après la mort de Schumann (un avis que partageaient Clara et Brahms, co-exécuteurs du testament musical du compositeur). En 1933, cependant, les petites-nièces de Joachim, les violonistes Jelly d’Arányi et Adila Fachiri, affirmèrent avoir reçu d’outre-tombe des instructions leur indiquant où dénicher le concerto de Schumann. (Plus prosaïquement, elles savaient peut-être que le premier mouvement avait été joué trois ans auparavant au dixième anniversaire de la Schumann Gesellschaft de Zwickau.) La partition fut localisée à la Bibliothèque nationale de Prusse et, contre la volonté d’Eugenie (une des filles de Schumann), elle fut préparée en vue d’une publication chez Schott, avec l’aide du compositeur Paul Hindemith. Le Concerto pour violon fut créé devant les dignitaires nazis Robert Ley et Joseph Goebbels, le 26 novembre 1937, par Georg Kulenkampff et l’Orchestre philharmonique de Berlin placé sous la baguette de Karl Böhm. Ce qui avait été considéré pendant des décennies comme un échec fut alors, pour des raisons politiques, annoncé comme un chef-d’œuvre—venant même remplacer le populaire Concerto pour violon de Mendelssohn (interdit d’exécution à cause des origines juives de son auteur). Dix jours plus tard, Yehudi Menuhin—qui, en tant que Juif russo-américain, n’avait pas été autorisé à assurer la première allemande—le joua avec accompagnement pianistique au Carnegie Hall de New York; plus tard, il en donna une version intégrale avec le Saint Louis Symphony Orchestra. Menuhin vit dans le Concerto pour violon de Schumann le «chaînon manquant» entre Beethoven et Brahms. Il a, affirma-t-il, «la même chaleur humaine, la même douceur caressante, les mêmes audacieux rythmes mâles, le même charmant traitement en arabesques du violon, les mêmes thèmes et harmonies riches, grandioses». La dette envers Beethoven transparaît dans la manière dont Schumann enchâsse le violon dans l’orchestre, tous deux travaillant en partenaires, sur un même matériau. Quant à Brahms, il est prophétisé dans la conception des liens motiviques entre les mouvements. Ces œuvres pour violon et orchestre marquent donc peut-être moins la fin de la carrière de Schumann qu’elles ne jettent un pont entre les générations. Wie bei der Phantasie sandte Schumann die Partitur des Violinkonzertes in d-Moll WoO 23 (das er zwischen dem 27. September und 3. Oktober 1853 komponiert hat) an Joachim, um seinen Rat einzuholen; doch diesmal war der Geiger weniger begeistert. Während er die Melodie im langsamen Satz lobte, fand er den Solopart meistenteils unidiomatisch (Schumanns ausgiebige Verwendung von Arpeggien spiegelte vielleicht seine jüngste intensive Beschäftigung mit den Sonaten und Partiten Johann Sebastian Bachs, für die er Klavierbegleitungen ausgearbeitet hatte). Joachim bekannte später, er sei der Meinung gewesen, dass die Musik „eine gewisse Ermattung“ zeige. Es sollte Schumanns letztes Orchesterwerk sein. Das Violinkonzert ist ein großartiges Moll-Pendant zu Beethovens Vorbild. Es beginnt mit einem brütenden Thema, das vom ganzen Orchester gespielt wird; das lyrische zweite Thema erscheint kurz vor dem Einsetzen der Geige. Die Form dieses Satzes und die Beziehung zwischen Solist und Orchester ist viel konventioneller als jene im Cellokonzert; doch wieder sind der zweite und dritte Satz miteinander verbunden. Hier wird jedoch Musik aus dem zweiten Satz (Langsam)—das synkopierte Orchesterthema—im Finalsatz wieder aufgenommen. Überraschenderweise wiederholt Schumann hier jedoch nicht die Melodie des Solisten, die dafür an anderer Stelle wiederauftaucht: sie ähnelt der Gesangslinie am Beginn von Frühlings Ankunft op. 79 Nr. 19, dem Mittelteil von „Vogel als Prophet“ aus Waldszenen und dem Allegro aus Norbert Burgmüllers zweiter Sinfonie, die Schumann kurz zuvor orchestriert hatte. Die Melodie gleicht auch auffallend jener, die ihm vom Geist Schuberts und Mendelssohns während der Halluzinationen im Februar 1854 diktiert worden sei, wie er behauptete; über diese schrieb er Klaviervariationen (die in poetischer Freiheit allgemein Geistervariationen genannt werden). Joachim fand den Finalsatz des Violinkonzertes allzu repetitiv, eine Kritik, die oft gegen Schumanns Spätwerke erhoben wurde. Bisweilen resultierte der Eindruck häufiger Wiederholungen daher, dass der Komponist sich auf eine begrenzte Anzahl von Themen konzentrierte. Gelegentlich wird auch auf ein unglücklich gewähltes Tempo verwiesen. Hinsichtlich des Violinkonzertes neigten die Interpreten vor dem Erscheinen der Neuausgabe in den 1980er Jahren dazu, den zweiten Satz langsamer zu nehmen, als im Autograph nahegelegt wird, während sie die Polonaise im Finalsatz sehr viel schneller spielten. Trotz weniger Proben mit dem Hoforchester von Hannover hat Joachim das Konzert nie öffentlich aufgeführt und empfahl, es erst hundert Jahre nach Schumanns Tod zu veröffentlichen (diese Meinung teilten auch die anderen Nachlaßverwalter von Schumanns musikalischem Vermächtnis, Clara and Brahms). 1933 behaupteten jedoch Joachims Großnichten, die Geigerinnen Jelly d’Arányi und Adila Fachiri, Anweisungen aus dem Jenseits erhalten zu haben, wonach sie Schumanns Konzert ausfindig machen sollten. (Prosaischer gesagt, dürften sie auch gewußt haben, dass der erste Satz anläßlich des zehnten Geburtstages der Schumann-Gesellschaft in Zwickau drei Jahre zuvor gespielt worden war.) Die Partitur wurde in der Preussischen Staatsbibliothek gefunden und, entgegen den Wünschen von Schumanns Tochter Eugenie, für die Veröffentlichung bei Schott mit Unterstützung des Komponisten Paul Hindemith vorbereitet. Die Premiere des Violinkonzertes fand vor Nazi-Größen wie Robert Ley und Joseph Goebbels am 26. November 1937 mit dem Solisten Georg Kulenkampff und den Berliner Philharmonikern unter Karl Böhm statt. Was jahrzehntelang als mißlungenes Werk galt, wurde nun aus politischen Gründen als Meisterwerk gefeiert—ja sogar als Ersatz für Mendelssohns beliebtes Violinkonzert (dessen Aufführung wegen der jüdischen Herkunft des Komponisten ausgeschlossen war). Zehn Tage danach führte Yehudi Menuhin—der als russisch-amerikanischer Jude die deutsche Premiere nicht geben durfte—das Konzert mit Klavierbegleitung in der New Yorker Carnegie Hall auf; später spielte er die Orchesterfassung mit dem St Louis Symphony Orchestra. Menuhin würdigte Schumanns Violinkonzert als das „fehlende Bindeglied“ zwischen Beethoven und Brahms. Er meinte, es habe die „gleiche menschliche Wärme, schmeichelnde Sanftheit, kühne männliche Rhythmik, die gleiche anmutige arabeske Behandlung der Geige, die gleichen reichhaltigen und noblen Themen und Harmonien“. Dass Schumann Beethoven verpflichtet ist, läßt sich daran erkennen, wie er die Geige im Orchester verankert; beide fungieren als Partner, die sich das Material aufteilen. Auf Brahms vorausweist die Art, wie Schumann motivische Verbindungen zwischen den Sätzen herstellt. Daher kann man diese Werke für Violine und Orchester auch weniger als ein Zeichen für das Ende von Schumanns Karriere hören denn als Brücke zwischen den Generationen.